Simple and effective, The Chimney Balloon is the must-have for every energy-conscious home. Specially engineered, it stops warm air going up your chimney and draughts coming back down. What’s more, it’ll pay for itself within 3 months. Warm air rises and cold air falls. This simple scientific fact means that when you have an unlit fireplace, not only will the warm air leave your home, but cold draughts will be coming in. But ‘plug’ this hole with a Chimney Balloon and instantly, and for very little money, you’ll make your home a lot warmer. Now, how good does that feel? How it worksApart from being favoured by portly men carrying presents, chimneys also act as funnels to take warm air away. However, when this warm air is being sucked away, it also pulls in cold air. Which is why you can feel it rushing in through the gaps in floors, doors and windows. Block your fireplace though and not only does the heat not leave your home, the cold air isn’t drawn in. Simple really. 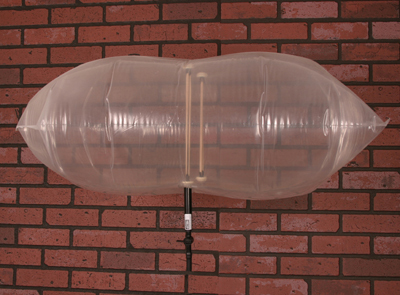 Just insert our specially engineered, guaranteed, and patented Chimney Balloon into your chimney opening, inflate and it’ll fill the gap but allow just a little ventilation. If you want you can safely leave it there for years until you next want to have a fire. Then you just deflate it and store it – ready to be used for when you next need it. We can supply and fit all chimney balloons.